IT Cosmetics HEAVENLY LUXE Plush Paddle Cream or Liquid Foundation Brush SEALED! 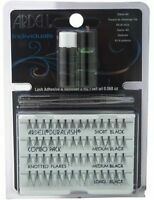 If you want perfectly, natural looking lashes, this style or model are the ones I find to be the best in this brand. Not too long, not much volume, third just perfect for every day! Love these lashes & this deal is great for people who want to save that extra cash! Highly recommends!